When I was a late teen and even into my university years, I don’t remember really enjoying cooking or even being very good at it. It wasn’t until I had my first apartment, with my first real job, that I started cooking dinners or breakfasts for Marcus and me. There isn’t much that I make that Marcus doesn’t give the thumbs up for, so with his encouragement and some recipe wins, I began to love my little kitchen. Marcus does this thing when he really likes something I’ve maked or baked, where he’ll give it a dollar value. Like “I would pay $5 for this scone”, or “you could sell this soup for $11”. 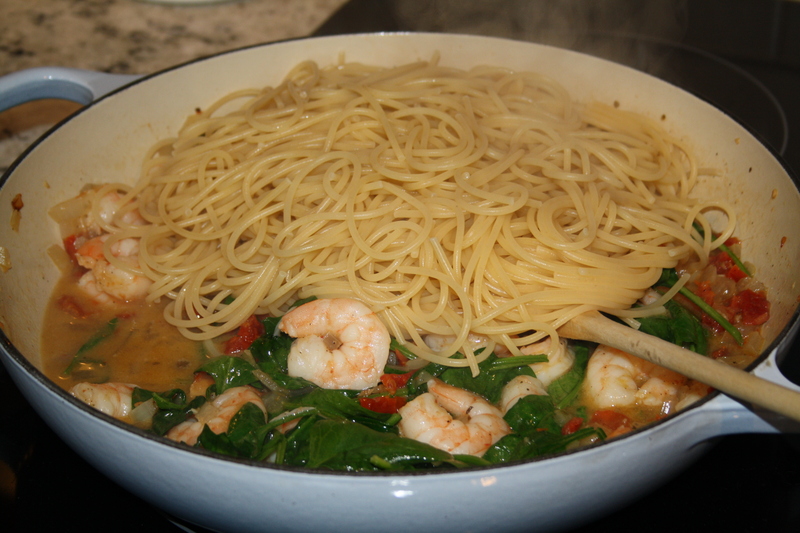 And this spaghetti, this light, delicious shrimp pasta, Marcus would pay $17 dollars for!! The Giada De Laurentiis suite of cookbooks, she has 7(! ), are some of the first cookbooks I ever bought, used, and liked. The first recipes I made from them worked, and made me feel good making them for Marcus and I, or guests. They gave me some confidence in the kitchen, and I enjoyed experimenting with ingredients or recipes I normally wouldn’t try. The majority of Giada’s recipes are super easy too, so they’re lovely for a quick meal, inspiration, or entertaining guests. 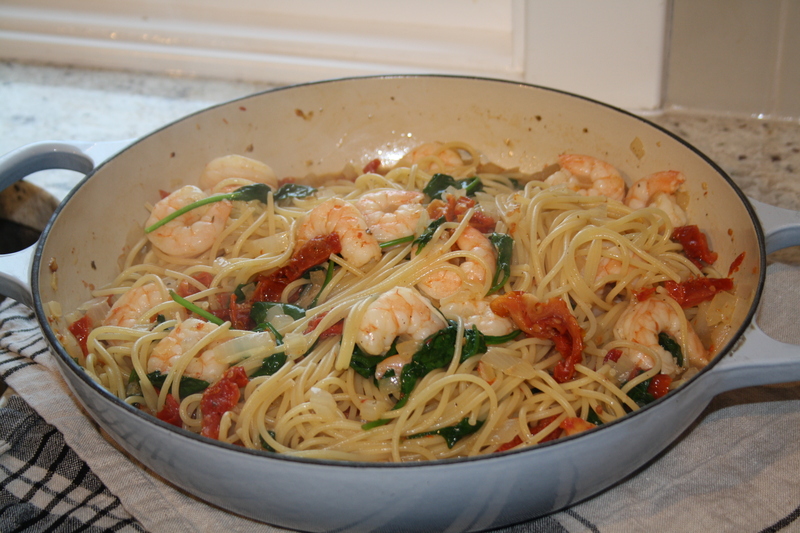 Some of my favourite recipes from Giada are her rosemary-strawberry scones, mascarpone chive dip, spicy baked mac and cheese, muffin tin frittatas, and this tasty shrimp spaghetti. I’ve made the recipe, as written by Giada, several times. I prefer my seafood in this dish to only be shrimp, for pure laziness easiness, although clams or scallops or even torn, cooked fish would be lovely. Arugula, or spinach as I’ve used here, lightens and brightens this dish up. And the tang from the sundried tomatoes balances the wine and fleshy shrimp perfectly. Don’t overcook the pasta. You want it just barely done, so that it holds up to the saucy goodness and doesn’t mush up. The best part about this pasta, is something I can barely describe. It becomes creamy as it cools slightly. If you have some for leftovers the next day, you’ll find the consistency of the sauce, either cold or warmed up, thicker and even more intense than when it first came together. What seems like a thin sauce, is not – trust me. Even served hot as the noodles and sauce come together will thicken up after a few minutes. With a salad and some crusty bread: happy days! Begin to heat a large pot of salted water, until it comes to a boil. While you’re waiting for the water to start boiling, begin cooking the rest of the ingredients. 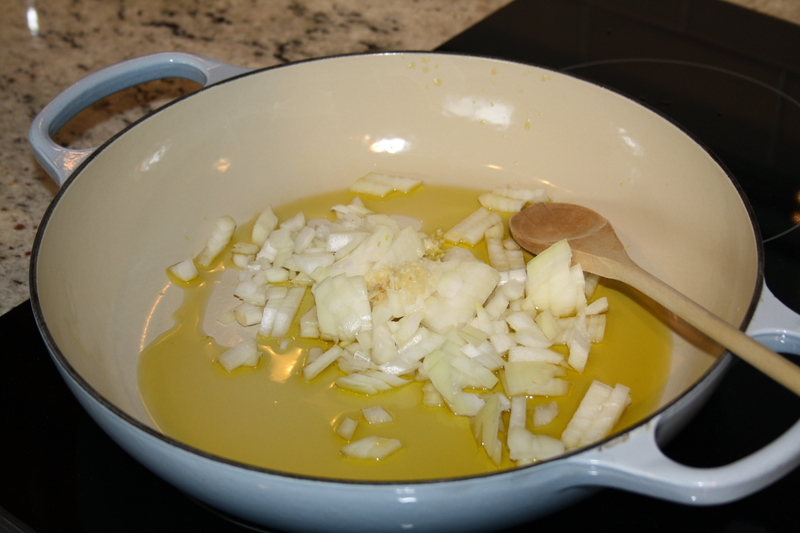 In a large, heavy skillet, heat the olive oil over medium heat then add in the shallots and garlic. Cook, stirring occasionally, under just tender, about 4-5 minutes. Stir in the sun dried tomatoes, then add the wine and shrimp and bring to a boil. Sauté for about 8 minutes, stirring every once in a while, until the shrimp become slightly pink. 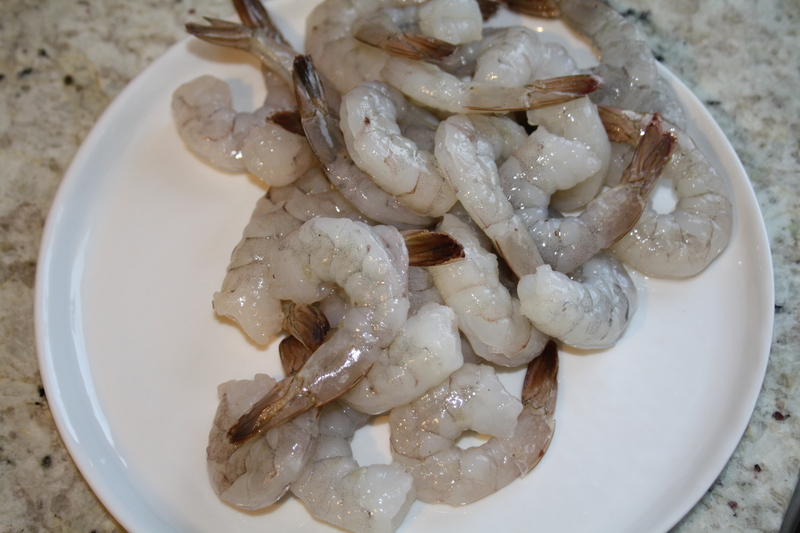 While the shrimp is cooking, your pot of water should be at a boil so add the spaghetti and cook according to the advised cooking time on the package. 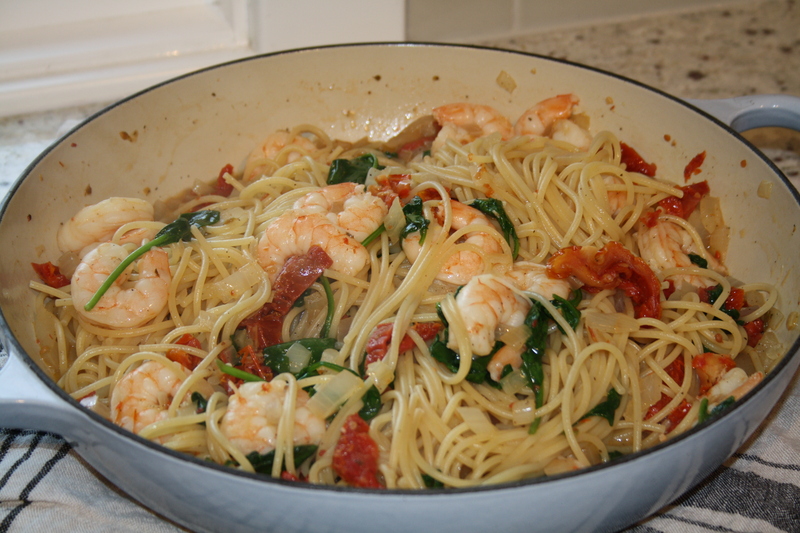 Drain the spaghetti then add the pasta to the skillet with the shrimp. Add the salt and pepper, then toss in the baby spinach. 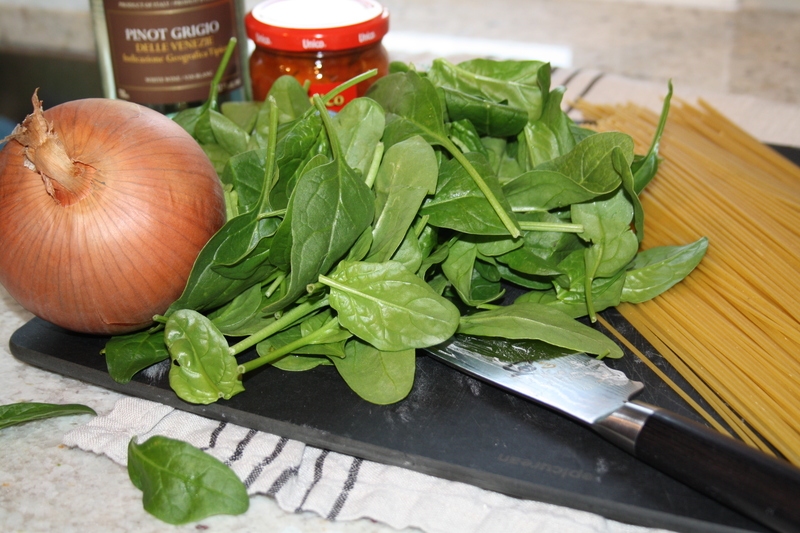 Turn off the heat and let the spinach slowly wilt as you gently stir it in. Serve right away. This is also good cold!